Everton head to Bloomfield Road more like the side that they are, rather than the team their results at the start of the season suggested. They played well at the start of the season but didn’t get the results, but now they have both. Blackpool on the other hand will hope that their bright start to the season will keep ticking along nicely. Everton have a number of quality individuals, like Man City who came to Bloomfield Road recently, the difference with Everton is that those individuals are blended nicely in to an effective team. Their formation is a slightly lopsided 4-1-4-1 due to Steven Pienaar cutting in from the left flank. The formation is fluid in midfield, unlike the very static 4-1-4-1 that Blackburn play. The teams may well line up as below. Holloway does like to shuffle his team from time to time, however, this is based on the same line up as the West Brom game. Looking at Everton’s play this season, they appear to favour the left hand side when attacking, which is funny, ’cause so do Blackpool. Should both teams stick to this pattern then both right backs will have to be playing to the best of their ability. Neil Eardley has been very solid since coming in to the side winning 13 out of 20 tackles this season, but this could well be his toughest test yet. Everton have Phil Neville in at right back and he is currently enjoying a great start to the season. 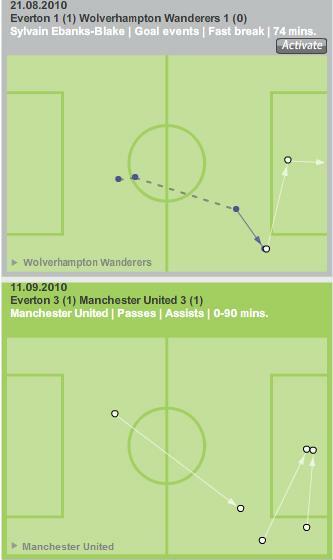 He worked dillengently to shut out Gareth Bale the other week, so much so that Bale was put on to the right wing to avoid him. What could be the key is which team fights their instincts and gets a better balance to their attack as gaps should emerge down the right hand attacking side. Gary Taylor-Fletcher has been there for most of the season and Blackpool will look to him to exploit space should he start. However, the pace of Matthew Phillips might be more suited to getting the most out of such space especially as it appears that Taylor-Fletcher has a tendency to drift. Looking at the eight goals that Everton have conceded this season (second best defensive record in the league after Chelsea) you can see that at least three of them came from moves down the right hand side as you can see below. 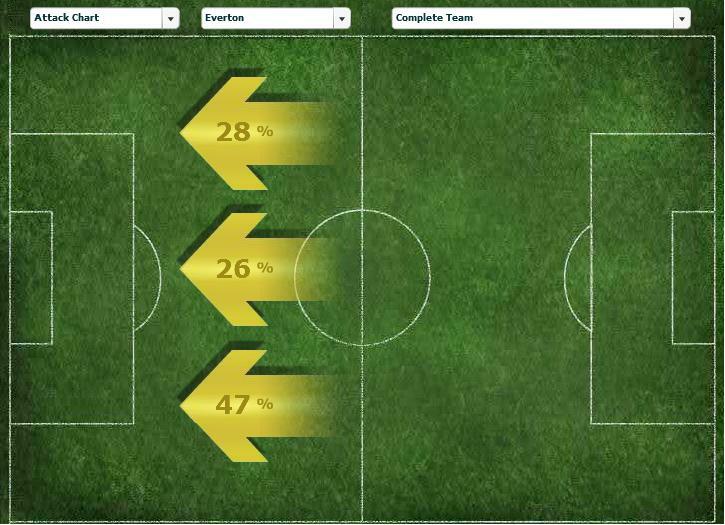 Everton have a fluid midfield who like to make runs from deep as Johnny Heitinga sits deep to provide defensive cover. Their team is roughly split in to 5 outfield defending players and 5 attacking players. 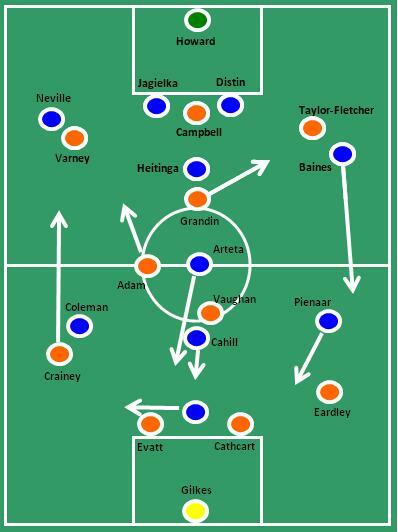 Which is a great division of labour, whereas Holloway tends to favour a blend of 4 defensive to 6 attacking. Everton’s greater balance in this respect may well give them more defensive solidity and make it especially hard for Blackpool to break them down. What is known is that if Blackpool should breakdown the Everton defence then they need to take their chances, time and space are more limited in the top flight and Blackpool’s strikers are beginning to find that to be the case. It should be a good tactical match up, plenty of movement, good passing and good use of space (both creation and exploitation of) and the best side should be the one that strikes a greater balance to their attack whilst defending resolutely.